Millennium Recycling Toys – Not in the Bin! Whether you’re a parent, a grandparent or a kid yourself… you probably have giant bins filled to the brim with toys. The amount of toys kids have today has become a little overwhelming, and the issue of getting rid of them is just as big! Because toys are made up of so many different materials, they are extremely difficult to recycle. What does this mean? 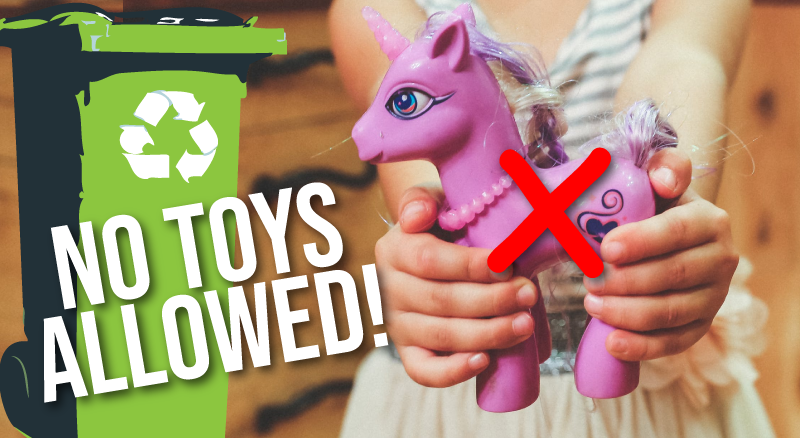 You should NEVER put children’s toys in your recycling bin! At Millennium, our process is designed to sort out single stream items. If complex items like toys come in, they damage the equipment or worse, injure our employees. What to do with Toys? Some charities will even give you a tax-deductible receipt for your donation, so be sure to ask for one if you want it. Alternatively, some toy manufacturers have recycling programs to send toys back for special dismantling and reuse. If not, and your toy does not meet the above donation guidelines, unfortunately the final resort is to trash them. If you do throw them in the trash, you should also remove any batteries to prevent fires in the garbage truck or at the landfill – Batteries can be recycled at the Sioux Falls Household Hazardous Waste Facility or at SEAM. Thanks for keeping toys out of the recycling bin and keeping the Sioux Falls Single Stream moving! Have something else you’re not sure about? Use our handy Where Do I Take This tool to search the database of local places you can recycle almost anything. If you don’t see what you’re looking for, just ask us! There are 0 comment. on "Toys – Not in the Bin!"